Most of what we share at Cork Hounds is happy or informational. This post has more meaning and emotion than all the rest. For in November of 2017, I lost my best friend, Bentley. To remember and immortalize him as best I could, I began writting Bentley's story in early 2018, that would ultimately come to occupy this corner of our site. I come here often, to remember him, and the time we shared, making small tweaks/improvements. The journey that started nearly 15 years prior to his passing is so rich with adventures and memories, that thinking about it in detail has been difficult. However, it is important to me that Bentley be remembered; he lived a special and unique life, one that had such a profound impact on my own. He was the first Cork Hound, after all. Before moving to Germany, I often thought about getting a Dachshund of my own. My parents and I had a family Dachshund during my teens and early twenties whom I loved dearly. I really like the personality of the breed. One afternoon in 2002, a friend of mine and I were discussing dogs; I shared my desire to have one, and she suggested names for my future pooch, one of which was Bentley. I really liked that name and it stuck with me. After I moved to Germany in early 2003, I picked up a Stars and Strips newspaper. Inside was an advertisement for Dachshund puppies! I decided to investigate. Bentley was born in a family farmhouse in the town of Giebelstadt, Germany in June of 2003. The farmhouse is part of the Dashing Dackels compound, a Kennel/Breeder of Dachshunds (and Collies at that time). The word "Dackel" is German for Dachshund. In July/August, I decided to make the 1 hour and 30 minute trip to Giebelstadt to visit the breeder and meet their pups. That first drive from Frankfurt to Giebelstadt was very memorable because it was my second road trip through the scenic German countryside. I couldn’t know then how important that trip was, or that I would make a decision that day which would have such a significant impact on my life for fourteen and a half years to come. Once I arrived at the Dashing Dackels farmhouse, the owners greeted me warmly and welcomed me into their home. We sat down in their living room where an adorable litter of puppies was playing inside a gated playpen. During the course of our conversation, they opened the pen, freeing the newborn dachshunds from their confines. Bentley was very tiny, being between six and eight weeks old. He had the most visually striking colors in his litter, with sharply defined, vibrant black, white and brown patches. I noticed him right away, and thought he was the cutest one in the pack. This is the first time I had ever seen a piebald Dachshund, as I was more accustomed to the black and tan variety. I remember that he still didn’t have his full eyesight at that time, as he crawled instinctively out of the pen into the vast expanse of the living room with his brothers and sisters. All the puppies headed in different directions, fanning out into the room. It seems now like fate had a hand in our meeting that day, as Bentley chose to head directly toward me. I watched this tiny puppy make his way slowly across the rug while I spoke with Mr. and Mrs. Pearson. Bentley approached the side of my sneaker and walked straight into one of the dangling ends of my shoelaces. He immediately became entranced by the shoelace, gnawing and tugging at it. For the next thirty minutes or so, he worked his way up to the knot and began untying the shoelaces. He actually managed to untie the knot, which was quite impressive for a puppy his size! All this activity really exhausted him, and it looked as though he was going to fall asleep right then and there. So, I picked him up, put him on the couch next to me and began to scratch his chest/belly. In no time, he fell asleep and started to snore. Bentley chose me to be his human that day ... and I decided to become Bentley’s dad. I returned in September to pick Bentley up after he turned twelve weeks old. This would be the first time he left his family and friends, and he was quite vocal that day about how much he missed them. He cried (whined) the whole way home. You can imagine how sad and scary it must be for puppies to leave behind everything/everyone they know, to include their mom, siblings, and friends. But soon, we were playing and building a life together filled with road trips across Europe, long walks through the German countryside, toys and puppy treats. 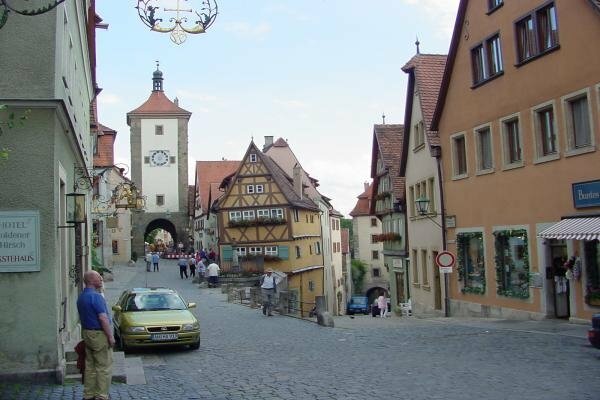 The time that Bentley and I spent in Germany was very memorable. Just a boy and his dog, with the luxury of living abroad in Europe. This was both amazing and terrifying at times, as we were somewhat socially isolated in a foreign country, left to deal with anything that came our way. In my mind, this strengthened our bond because we were all the other had when it came down to it. For example, early on I would discover that Bentley had a delicate immune system as a pup. He endured two bouts with pnemonia, the first of which was life threatening and appeared within six months of bringing him home from the breeder. Luckily, most Germans speak English (because I would only come to speak 'ein bisschen deutsch', or a very 'little bit of German'). Relying largely on the kindness and patience of others, we were able to navigate the Veterinarian system to great affect and help Bentley get through his early years. Fortunately his immune system would strengthen in time. In 2006, Bentley would receive his United States citizenship when my career took me to Virginia. We flew business class from Germany so that we would have plenty of room to spread out for the eight hour trip. 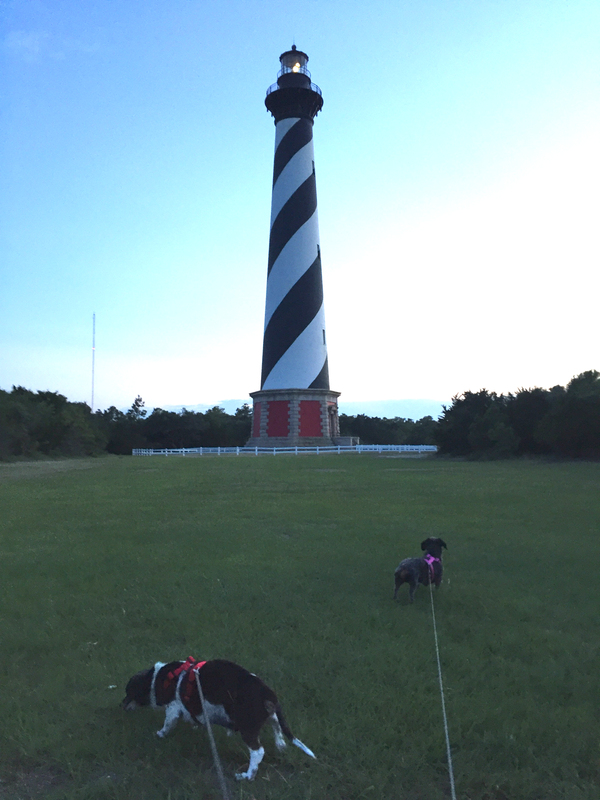 Dachshunds do not travel light! We boarded the plane before most passengers that day, taking an aisle seat on the wide-bodied aircraft. I held Bentley on my lap in his tan Sherpa travel bag with the top opened so that he could get some fresh air and take in his surroundings. I recall many of the passengers stopping to pet Bentley as they boarded. Who can resist a friendly Dachshund? Bentley spent the majority of his adult life living in the United States. There is a significant amount of photo evidence to support the fact that Bentley spent much of this time sleeping, eating and sniffing (for food, of course). I continued to make it my mission in life to expose Bentley to as much of the world as I could to make up for the boring parts of his life ... like sleeping away the day while I was at work or while I did homework through two separate Degrees. In between that and lots of naps/cuddles, I looked for every opportunity to get him out of the house. At first, this involved walking/exploring the local landscape, and road trips to see friends and family on holidays/vacations or to local haunts like strolls on the Washington D.C. mall. Along the way we eventually met Peggy, who in time decided she also wanted to have a Dachshund. This search lead us to Greta, a wire haired Dachshund rescue, who at the time was with a foster mom affiliated with All American Dachshund Rescue. Peggy, Bentley and I made the trip to Tennessee to pick up Greta. Peggy and I wanted to go to dog-friendly places with the pups. Our search lead us to local and remote vineyards and wineries. It was on one of these trips during a cold Winter, when we traveled to Harper's Ferry, WV., that Peggy and I developed the idea of starting Corkhounds.com. We couldn't easily determine which vineyards near our Homeaway rental would allow us to bring Bentley and Greta into the tasting room. A problem we wanted to solve for ourselves and others. These were Bentley's golden years; not simply because he was getting older, but because he had lots of companionship, and new treats/smells to enjoy. 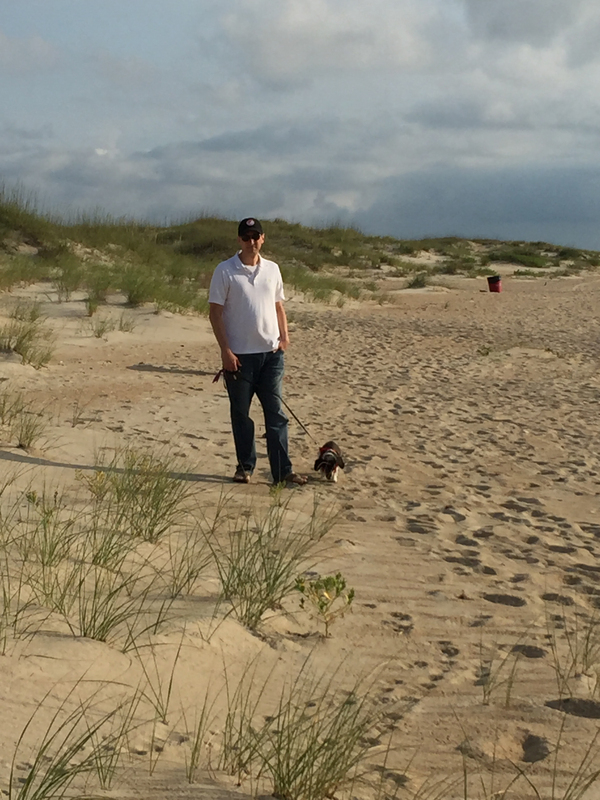 It was during this time that Bentley would see his first beach at Cape Hatteras, and take up boating. Bentley was content wherever his humans were, as long as food and water were plentiful. After getting the boat, I couldn't resist getting Bentley a special hat. This may only be one of two times I made him wear it. For two summers, we would take the dogs down to the boat, ocassionaly taking them out or just relaxing with the gentle motion of the waves. Bentley loved being outdoors, and sticking his nose into the wind in the search for new smells. And through much of it, he would have his trusty sidekick, Greta. She was/is adept at stealing the stage, relishes in competing for attention, and not willing to play second fiddle to anyone. Both Bentley and Greta are fickle when it comes to other dogs, as they are choosy about who they want to rub noses with. But the two of them hit it off from the start. The first day they met, it was as though they were brother and sister. In November of 2017, two Mondays before Thanksgiving, Bentley had a bad (grand mal) seizure, the first I was aware of. We rushed him to the hospital, and through Tuesday would learn from the Oncologist that Bentley had a brain tumor and signs of Dementia. Hearing all this dealt an enormous emotional blow. I had fought so hard to keep Bentley safe and healthy … but it became apparant that we were fastly approaching the end of our journey together. I discussed the options with Peggy and my family, but given his age of 14+ and his other health issues (the Cushings, and Dementia), we felt it was best not to do stereocopic radiation or surgery. It would have just been too hard on him physically and the outcome not without serious risk and uncertainty. We immediately put Bentley on anti-seizure medicine and hoped to have, based on his prognosis, one to four months more with him. Unfortunately, his conditioned worsened rapidly through that week, having many back to back focal seizures (six though the following Thursday night into Friday), the majority of which were 10 minutes in length. While the focal seizures were less violent, they were still disorienting and very frightening to Bentley. The medicine wasn't stabilizing his condition, and it had serious side effects, which greatly impacted Bentley's ability to stand and walk. Given Bentley's terminal condition, the impact of the seizures and medications, the longer term risks (e.g. status epilepticus), and the concern for putting him through any more seizures unnecessarily, I made the toughest decision I’ve ever had to make in my life ... that of letting him go. Peggy and I did not want to put him through another visit to the Veterinarian because it stressed him out so much. So, we hired a Veterinary Hospice called Lap of Love to come out to Peggy's place in DC. The doctor from Lap of Love evaluated his quality of life, and agreed it was time to help him across the Rainbow bridge in the comfort and safety of home. While I knew this was the best thing for him, it was devastating to say goodbye. I held him close throughout, scratching his chest and belly just as I had done the day we first met, and told him how loved he is. One of my favorite songs is called "I Remember You", as sung by Nat King Cole in 1960. Mr. Cole was one of many recording artists to release a rendition of that song, but his was the best, in my opinion. In that song, Mr. Cole sings "When my life is through, And the angels ask me to recall The thrill of them all, Then I shall tell them I remember you." That same idea ... that the Angels will greet you after you pass over, and ask you about your favorite thing was also reflected in the movie "City of Angels", a film with Nicolas Cage and Meg Ryan. It's a nice thought. Looking back now, it is safe to say that Bentley's favorite things were christmas presents, naps in the sun, cuddles and hugs, and food of all shapes and sizes. Most days, he appreciated the simple pleasures. I would often place one of his beds in the sun so that he could get warm. Other times, I would pick him up and bring him to the couch so that we could take a nap together. Breakfast and dinner time were his favorite part of the day. At Christmas, he loved to sniff the presents to see if they might be edible. He would inspect them for a point of entry, tipping over bags and moving boxes to see if he could get his nose inside. His favorite things to eat were cooked meats, ice cream, cheese, and smelly natural dog treats. Losing a pet is debilitatingly painful. In our case, Bentley's illness came on suddenly, and without much warning which made it that much more difficult to deal with. Bentley had already had a long life, but through this experience I learned that other dogs aren't so lucky. It is important that we continue to fund Cancer research for possible treatments. Our dogs and fellow dog owners deserve nothing less. I have made a donation on Bentley’s behalf to the Animal Cancer Foundation (http://www.acfoundation.org/), and ask that you do too.